The thing I like best about the music of Barcelona’s Los Amaya is that, on their best songs, you can’t easily place where in the world their sound is coming from. I was first introduced to them through their single, “Caramelo a Kilo” and with that wickedly fast guitar and hand claps, I heard some variation on flamenco but there were other parts that felt totally Afro-Cuban and there were underlying touches of soul and funk too. It wasn’t until I read the liner notes to Achili Funk: Gipsy Soul 1969-1979 that I realized this style had a name: rumba catalan. As my ears had suggested, this wasn’t a “pure” style born exclusively to Spain or Cuba. Rather, it represented the “return” to Spain of Afro-Cuban styles innovated by the descendants of slaves first brought over by Spanish slave ships. Passing back into Spain via the province of Andalusia, Latin styles such as the son, guaracha and guaguanco merged with elements of the flamenco and by the 1960s and ’70s, the rumba catalana was in full swing. According to Txarly Brown’s exhaustive liner notes for Achili Funk, Los Amaya brought together gypsy brothers, José and Delfín Amaya who were barely out of their teens when they first began recording for EMI Regal. 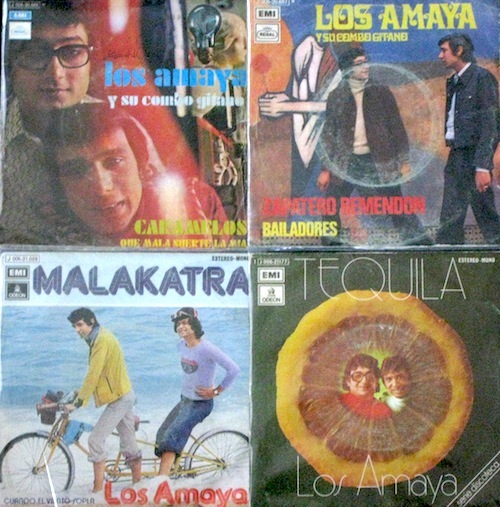 Most of their early singles were collected on the group’s 1971 album for EMI, Los Amaya y Su Combo Gitano, (released on Sabor for the American market in 1972, simply entitled Los Amaya). Imagine an entire LP similar to the first two songs. Sounds pretty good, right? What’s especially great is that there’s video of the group performing the first three songs. Peep the nerdy-chic estilo! The group’s second and third albums both appeared on EMI/Odeon and I only have one single each off those LPs (and therefore can’t speak to what the entire albums sound like). What I can say is that even though the group’s uptempo tracks are what I’m likely to spin out, right now, my favorite song of theirs is actually a slower track from their third album, Tequila (which was also a 7″): “Mi Son Gitano.” I’m just taken by the melodic elements here, especially the melancholy guitar arrangement which blends the best of the Cuban son tradition with a uniquely Catalonian sensibility. The background singing is especially effective. If you like what you hear, definitely check out that Achili Funk compilation for more rumba catalan craziness. Speaking of summer… does anybody know a really funky version of “summertime”. I want it dripping with soul. I used to have one but my computer crashed and took all my music with it. i dont remember who sang it, but it was a woman. Thanks for your help and apologize if this isnt where I should have posted my question. p.s. I love the amaya tunes as well! THANK YOU for introducing me to my new obbsession! Yes, the music is amazing, but those clips on youtube are the coolest thing I have ever seen! I love these guys but it looks like finding their 60s / 70s material is going to be a little difficult. A new quest! p.s. WordPress RULES, you’re going to love it.